The new Creative Playthings playset was delivered and installed today. One guy showed up and put it all together in about 3 hours. 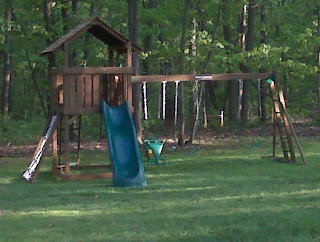 For me, it was leave for work, work all day, come home and watch the kids play on the playset. Nice. I'd like to see you try to keep my son off that "Whee!" (or slide in big people terms) at Adrian's party!